You may fall asleep easily while listening to your favorite music! 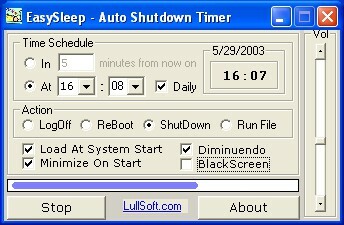 Auto Shutdown Timer - EasySleep 3.0.0 is other software developed by LullSoft.com, Inc.. This other software is shareware, which means you can download and use Auto Shutdown Timer - EasySleep 3.0.0 for free during the trial period (usually for 30 days). At the expiration of the period you will have to buy the other product for $18.95. Auto Shutdown Timer - EasySleep 3.0.0 is available at regnow and LullSoft.com, Inc. website. Auto Shutdown Timer - EasySleep 3.0.0 supports different languages (including English). It works with Windows 98/XP/Vista. We have tested Auto Shutdown Timer - EasySleep 3.0.0 for spyware and adware modules. The software is absolutely safe to install. Our website has thoroughly tested other product Auto Shutdown Timer - EasySleep 3.0.0, written the review and uploaded installation file (288K) to our fast server. Downloading Auto Shutdown Timer - EasySleep 3.0.0 will take several seconds if you use fast ADSL connection. Power Guardian monitors a connected UPS (uninteruptable power supply) and if the power event is sustained, safely shuts down your computer, even saving your open files and work-in-progress. Schedule shutdown, reboot and relogon to your computer.